hike under the recommendations of the Majithia Wage Board. Dismissing pleas by various owners seeking a review of its earlier judgment, the Supreme Court directed publishers to implement the recommendations of the latest wage board from this month on. government notified the recommendations of the Majithia Board. employees in four equal installments within a period of one year and continue to pay the revised wages from April 2014 onwards,” the verdict noted. other newspaper employees under the leadership of Justice GR Majithia was presented to the Union government in New Delhi on 31 December 2010. He added that the report made suggestions for the consideration of the government on issues like post-retirement benefits, a forward looking promotion policy, measures to improve enforcement of the wage board etc. As far as social security measures are concerned possibility of granting paternity leave to male employees, extension of retirement age up to 65 years, exploring pension scheme possibilities were suggested going beyond the mandated wage structure revision, he added. The wage boards for newspaper & news agency employees including journalists, constituted under the working journalists and other newspaper employees (conditions of service) and miscellaneous provisions act 1955, are statutory. The prime responsibility for implementing the recommendations of the wage board rests with the concerned province governments and Union territories of India. “Journalists are paid a lump sum without any welfare benefits and they can be dismissed at will. Except for some newspapers the mainstream publications had, ever since the wage board’s award came out in 2010,conducted only diatribes against the award,” said an editorial of Economic & Political Weekly, a credible publication of India in its 29 March 2014 issue. salary and working conditions of media persons in India. non-journalists on their pay structure, the AHRC urged media houses to honor and implement the recommendations of the latest wage board as a matter of priority. It also called upon the State governments to ensure a safe working atmosphere for journalists and make provisions for social benefits like health and life insurance for the media employees. The Assam Tribune group of newspapers based in Guwahati was the first media house in India to implement the recommendations of the latest wage board since January 2012. The 70 years old media house did not wait for the apex court verdict, as done by many big newspaper groups of the country while challenging the constitutionality of the Majithia Wage Board in the Supreme Court. All Assam Media Employees Federation (AAMEF), while addressing the matter of livelihood for media workers in northeast India has urged the newspaper house managements to show their respect to the Supreme Court by implementing the new wage board from this month. “We have a model media house (Assam Tribune) that has successfully survived for two years with the new wage board facilities to the employees. Now we do not accept any logic that the Majithia recommendations are not implementable. You have to have the minimum commitment to the medium,” said Hiten Mahanta, president of AAMEF. Assam, expressed dismay that most media groups in the country have made it a habit to show a loss-making balance sheet every year with an aim to avoid paying proper salaries to the employees. privately-owned satellite news channels with systematic pay hike as like their counterparts in the print media. The Assam-based scribes' body pointed out that nearly 70 percent television journalists were still performing their duties with pitiable salaries (read monthly financial package), unlimited working hours and without any facilities recommended by the country's labour laws. 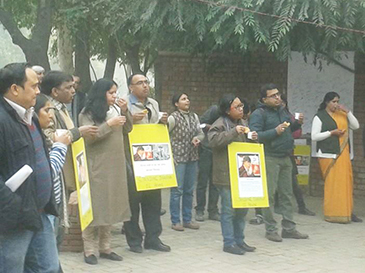 “More over, we demand for a social media audit where the esteemed readers & viewers can find a transparent picture of the financial dealings involved with their favorite newspapers & news channels,” said Rupam Barua, president of JFA adding that the exercise would ultimately help the media employees including the working journalists in getting their due benefits under the law of the land.